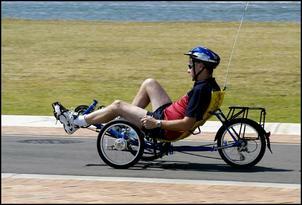 Why build a human-powered vehicle? Vehicles of this type are amongst the most innovative that you’ll find on public roads. The construction and suspension designs are cutting edge for ultra light-weight, good-handling and extraordinarily comfortable vehicles. I choose to use human power to propel them, but exactly the same underlying philosophies apply even if the power-plant is electric, diesel or petrol. 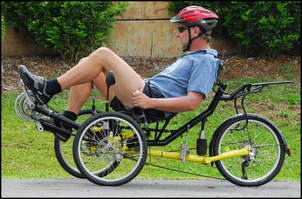 A human-powered vehicle (HPV) is able to be used on public roads without the legal difficulties that apply for every other innovative vehicle design. You might have a concept for a car powered by a steam turbine, or one that uses a petrol engine but has the wheels arranged in a diamond-shaped wheelbase pattern. But no matter how good it is, getting it legally registered on the road is likely to prove both expensive and difficult. This type of vehicle can be easily home constructed. You don’t need large facilities; you don’t need expensive gear like metal shears or metal benders. In fact, if you get someone else to do the welding, a vehicle like this can be constructed with just hand tools. If you buy an oxy-acetylene welding set-up, you can do everything yourself. So why now a third all-new design? Let’s briefly look at the first two designs. JET was my first attempt at a HPV. 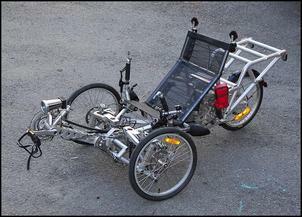 It was of the ‘tadpole’ trike configuration (two wheels at the front, one at the rear) and used a recumbent seating position (pedals out in front, large supportive seat inclined at about 40 degrees). It also had a suspension design too closely based on best car practice. The two front wheels had double unequal length wishbone suspension, complete with an anti-roll bar (arrowed). 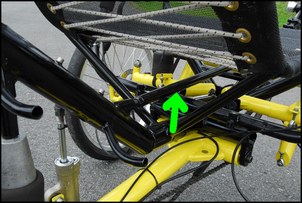 The rear suspension used a high motion ratio trailing arm. Steel coil springs were fitted and the frame was made from aluminium. The result was a machine that handled well, rode exceptionally well – and was too heavy. The aluminium also suffered metal fatigue. 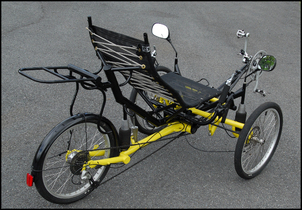 The Air 150, initially made as the prototype Air 130, was another recumbent tadpole design, but one that addressed all these shortcomings. It used Firestone rolling-lip airbag springs, a unique high roll centre, semi-leading arm front suspension, and a trailing rear arm suspension design. The frame was made from chrome moly steel tube and a high seating position was used. The result was a practical and effective vehicle, with an excellent ride quality and good handling. The downsides were that if it was being freighted interstate for touring, it required a very large packing crate. The high centre of gravity and soft suspension also meant that a very strong anti-roll bar needed to be used, and large torsional loads were fed into the frame. When loaded with about 30kg of touring gear, the steering could also become twitchy. However, the biggest negative remained its large size – despite appearances, this was not ever a problem on the road but certainly was when it needed to be freighted anywhere. In addition to designing, constructing and riding the above machines, I have also been lucky enough to be able to ride a range of other alternative pedal powered vehicles. 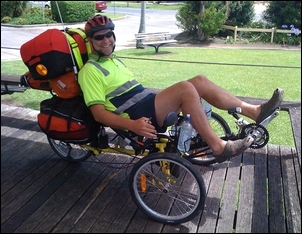 My wife is a Greenspeed dealer – Greenspeed is an Australian manufacturer of recumbent pedal trikes well respected around the world. I have therefore been able to ride pretty well all the Greenspeed designs, including tadpole, delta (two wheels at the back, one at the front), single and tandem trikes. In more traditional bikes, I’ve ridden a folding Brompton bike many kilometres (including touring with a child trailer and camping gear), and I’ve also spent a lot of time on a high quality commuting bike – a Gazelle with 28 inch wheels, and seat-post and front suspension. Finally, I own a Giant Revive – an innovative, crank-forward bike. That sure as hell doesn’t make me a guru of bicycle and tricycle design – but it has shown me very clearly the design criteria I think are most needed in an HPV. Especially since these criteria are often at odds with the prevailing wisdom, let’s take a closer look at them. The single most important criterion of human-powered vehicle design is comfort. 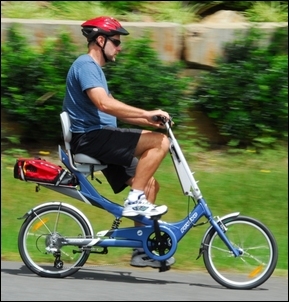 I am certain that the reason many people have a negative view of pedal power is not the physical effort needed, but the discomfort normally associated with that effort. But aren’t they the one and the same? Nope! 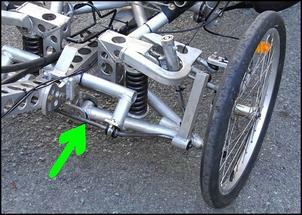 A recumbent pedal HPV with high quality suspension is just like that. You don’t feel any harshness or bumps, and there is no pressure on your arms or shoulders. When the physical discomfort of riding a typical bike is removed from the experience, you suddenly find that travelling a lot further is much more enjoyable. But I now realise that having a very wide range of gearing is much more important for a completely different reason. So what’s this reason? Irrespective of the load (eg towing a trailer or not), the wind (head-wind or tail-wind or no wind), and the gradient (up-hill, down-hill, flat), by having lots of gears you can maintain the same pedal speed (cadence) at the same physical effort (the ‘push’ you are applying to the pedals) all the time. This idea is a mile away from the traditional view of cycling where you try to maintain a certain road speed, changing gears and even standing on the pedals to achieve it in all conditions. But I think that having a constant ‘engine output’ is far better for the body – there’s never a need for sudden increases in muscle power, with the resultant sudden changes in blood, oxygen and energy flows. When touring on the Air 150, complete with 30kg of camping gear, I was quite astonished at how far I could travel by using the gears to maintain a constant pedal speed and pedal effort – picking the combination that felt perfect for me. 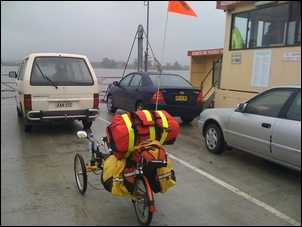 To give you an idea of how much better it was, I reckon it doubled how far I could comfortably travel in a single day. Short pedal cranks (eg 150mm) are much better for the knees than traditional long cranks (eg 170mm). Simply, the shorter leg extension is kinder on the knees. If a sufficiently wide range of gearing is provided to allow a ‘constant engine output’ approach to be taken, the vehicle will need to have more than two wheels. Why? Because up steep hills, the road speed might be only a few kilometres an hour – less than a walking pace – and a bike cannot be safely balanced when moving so slowly. If there’s one area that bike and HPV constructors seem to agree on, it’s that weight is critical – that everything should be done to keep it as low as humanly possible. 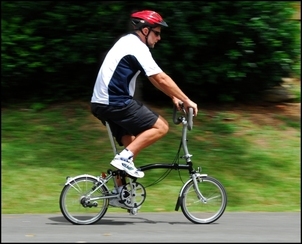 However, in fact I think it is better to have a heavier machine if it results in a major improvement in frame stiffness. A force of 120kg applied 150mm from the cog wheel axis results in a developed torque of over 175Nm! Depending on the front cog size, the chain is being pulled on with a force of up to 360kg! These are much larger forces than most people realise, and so it’s quite easy to build an HPV frame that deflects a lot under pedalling forces. I have found that a stiffer, heavier frame results in a machine that is easier to get moving, and has better hill-climbing performance, than one that is lighter but bends under pedalling loads. From my normal work driving and assessing cars, I have learnt one thing about vehicle handling that stands head and shoulders above the rest. The single most important aspect of vehicle handling is that it should be consistent. This means that operating the controls should result in the same outcome, largely irrespective of conditions like speed, road surface and pedalling. Achieving this is very difficult – after all, a given steering input at high speed will make the vehicle turn more quickly than at low speed, max braking performance will be affected by the frictional coefficient of the road surface, and soft suspension will mean that the machine will want to squat with pedal power inputs. But it is vital that the HPV design avoids brakes that drop in effectiveness by 70 or 80 per cent when the wheel rims are wet; or steering that becomes twitchy at speed; or suspension that develops a vertical pitch in just certain road conditions; or an HPV that when loaded with touring gear, behaves in a very different fashion from when it is carrying just a single person. I’ve put this in a separate box because this criterion will not apply to all people, but for me, the machine should be able to be broken down (or folded) so that it can be transported in as compact a package as possible. In the last few years I’ve pedalled machines in many different Australian cities – including Melbourne, Canberra, Brisbane and Adelaide. Being able to bring pedal transport with you by air is not just fun – it can save a lot of money on taxi fares and hire cars! The intention with Chalky (the HPV being developed in this series) is that it will be used for extensive touring – so it must be able to be freighted at reasonable cost. And, for me: be able to be packaged into a compact assembly for freighting to a distant place. As I mentioned earlier, the fascination of designing and building an HPV is the difficulty in reconciling conflicting demands. So when you look at the above points, it all seems petty easy and straightforward – until you start trying to devising the machine that can achieve them….while at he same time staying as light and compact as possible! So after names like JET, Air 130 and Air 150, why is this HPV design being called ‘Chalky’? It’s very simple: the basic layout of the new machine was developed, full-size, in chalk on my workshop floor. Despite this diagram then being photographed, drawn and redrawn, it has remained known in this household as ‘Chalky’.